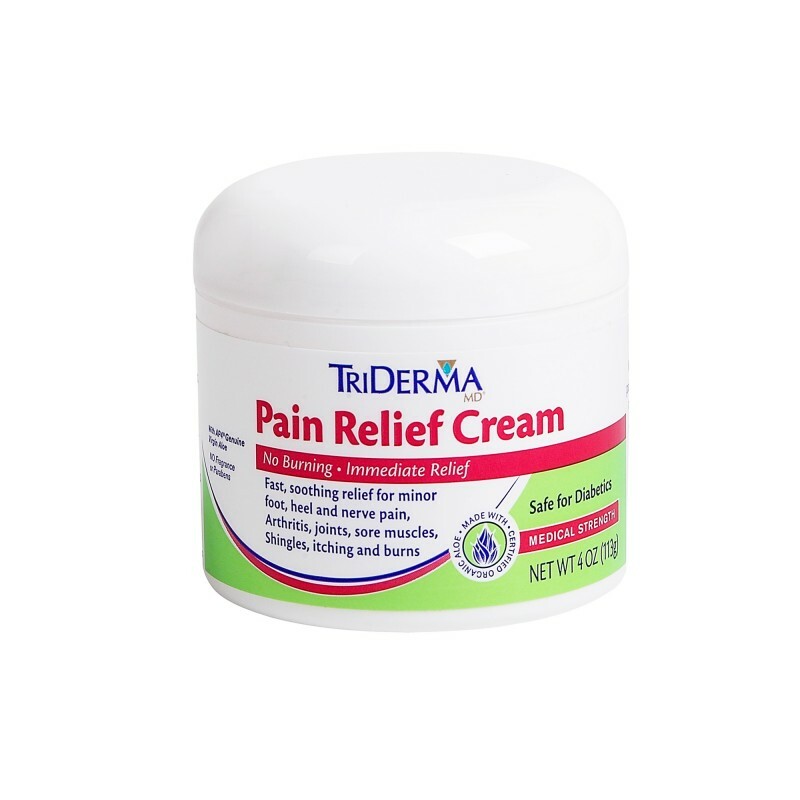 Pain Relief Cream™ is a unique formula that helps provide long lasting comfort and fast pain relief without burning or irritating skin. It contains multiple botanicals recognized by the Homeopathic Pharmacopoeia of the Unites States for their natural pain relieving and anti-inflammatory properties. It combines the best of science and nature to help relieve pain so that you can get on with your day. St. John's Wort, Arnica and Boswellia are active botanicals. Contains a touch of Menthol for extra pain relief- light scent disappears quickly. I was using a topical spray pain killer that did a decent job but smelled like a menthol bath. 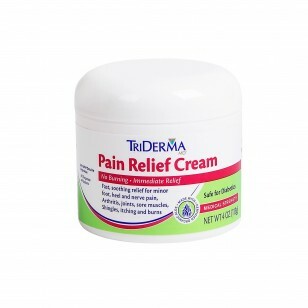 I got a sample of Pain Relief Cream with another Triderma order And liked that it was as effective as the product I was using without the strong oder. I use this product now and am very happy with it. Interestingly the smaller size is the best bargain. I was recently diagnosed with RA and my pain moves from feet to back to hands- depending on the day. I have digestive issues that rule out oral medications, so I must rely on topical and natural products for relief. When my feet are particularly problematic first thing in the morning, I use this product and am then able to move about to start my day. It provides enough relief that I can get dressed and start my day-- does not burn, and provides immediate relief for me. Would recommend if you need temporary relief. I had found a sample packet at work and tried it. I was hooked. So ordered myself 2 tubes of this. I am on my feet 8 or more hours a day and have arthritis. I tend to get a lot of Charlie horses in my calves and inner thighs. The minute I feel the tightening in the muscles I apply Pain Relief Cream to that area and the Charlie horses do not appear. Also my ankles tend swell at the joint and then they have this constant ache to them. I rub some of this cream on them and that ache goes away. The swelling also goes down some. I was a strong supporter of BioFreeze but now all I use is the TriDerma products. I have been suffering from Plantar Fasciitis for about a year now and the Pain Relief Cream really helps relieve the aching I get a night. It also helps with the stiffness in my fingers. My Podiatrist said she couldn't recommend anything better. I am so happy I came across this product. This stuff is super. we got the sample packet and it worked so well we bought the full tube. :) It really helps. I only had a small sample packet. Had a spider bite for over 2 weeks still itched and painful, would not heal. After just a couple applications over a 3 day period, no more itch or pain and it is now healed as well. Looks like new skin has grown over it. Apply externally to the affected areas up to 3 to 4 times a day. For use on adults and children 2 years and older. Children under 2 years - ask a doctor. "I sure do like the Pain Relief Cream. I have arthritis bad in my neck, back and hip. It is the best I have tried yet and I have tried lots of creams. I can put this one and I can sleep at night thats to you" Charles N.
"Helps with severe osteoarthritis pain in my knee. When applied frequently, definitely lessens the severity & makes it easier to bend it." Susan W.
"Great temporary relief of arthritis pain. Would highly recommend it! Non-greasy and no bad smell. Starts to work right away." Mary Joe B.